I can think of a FEW things that are good about winter: Michigan State basketball on the Big Ten network, the Winter Olympics, watching the Food Network and printing off recipes and making lots of comfort food, indoor tennis leagues, going someplace warm (Palm Springs or Arizona or Hawaii) and feeding and watching the birds. Seriously, I cannot add to this list! ice dams (which happen if you DON’T shovel your roof), cold beds – brrrr, having your car always crusted with road salt, tracking road salt into your house, not being able to sit by my pond or stroll through my gardens, falling asleep at 8 p.m., winter tomatoes (bleghckk), cold feet. Well, you get the idea! 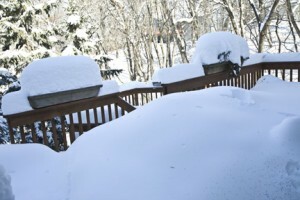 We recently had back-to-back snowstorms that have added an additional 18 inches of snow on the ground. We neglected to rake our roof and are now dealing with replacing all the wet insulation in the attic and having a bedroom ceiling scraped and re-done. A company had to come out and spend 7 hours removing 20 feet of thick ice dam on one side of our house with a steamer. This occured on a day that the high temp was 2 degrees. 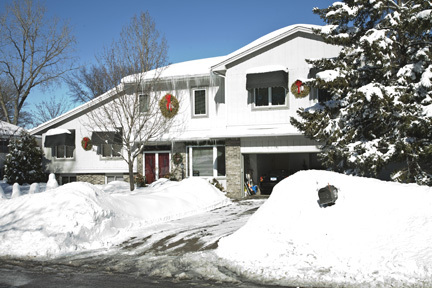 See the photo below where our yard is encased in ice and all the eaves are full of icicles! This turned our snowbanks, which were considerable, into veritable icebergs! They are NEVER going to melt until May! 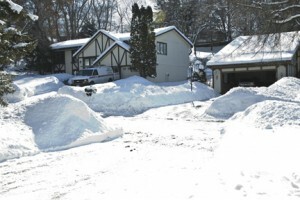 sigh….. And check out our mailbox: it was hit with a plow and embedded into the iceberg snowbank. I’m sure our mailman is NOT happy about trying to get mail into our box! Well, there is one pretty thing about a MN winter: the sky appears to be so much bluer against the white snow. After a heavy snowfall, the temps always plunge, which make the snow appear to “glitter”. Here are some photos of our Ice Palace. the last storm dumped an additional 12 inches new snow. This is our back deck. I now understand your roofing problem. You live at the North Pole. It is always sunny and warm here in tropical Livonia, MI. Hopefully spring will arrive soon to save your house. Good Luck. Is your “I Hate Winter” blog still active? I loathe winter – maybe more than you?